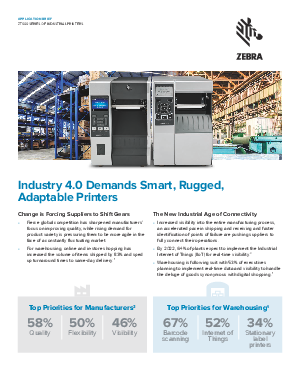 > Zebra Technologies > Smart, rugged and adaptable—the first industrial thermal printers built for Industry 4.0. To keep your operations running smoothly, you need industrial printers that are ready for today, ready for tomorrow, ready for anything. Link-OS® remote management and cloud capabilities give you complete visibility—anywhere, anytime. Secure cloud connections with advanced diagnostics let you scale up or down quickly and easily. Micro-consistent printing delivers high-quality labels as small as 3mm. Field-installable upgrades and flexible configuration options future-proof your set-up. Rugged environments? Demanding applications? Unpredictable challenges? Keep your supply chains working at full tilt with full visibility, thanks to the brawn, brains and adaptability of Zebra’s new ZT600 printers.